The Group’s environmental strategy focuses on the prevention and minimization of impacts on the environment through the implementation of adequate measures, practices and technologies throughout the product cycle. These are implemented from the design of the production scheme and the potential implementation of anti-pollution technology, through to the end use. a reduction in air emissions, effluents and waste. The systematic monitoring of developments in technology, environmental legislation and our active participation in the relevant information and consultation processes, contribute significantly to the realization of the Group’s strategy to pursue sustainable development; along with targeted environmental investments and extensive environmental education programs. All of the above have resulted in a remarkable reduction of air emissions, water and waste management, energy efficiency and the Group’s carbon footprint. The completion, in previous years, of the two major modernization - upgrading projects at the Elefsina and Thessaloniki refineries, amounting to €1.7 billion, resulting in a significant improvement of the refineries’ environmental footprint and the air quality in neighbouring areas, constitutes a most favorable condition and starting point with which to harmonize with the new emission levels recently decided at a European level concerning refineries. The Group’s main objectives continue to be continuously improving environmental performance in areas such as the reduction of the environmental impact throughout the product life cycle and the rational management of natural resources in the production process as well as their contribution to addressing climate change by improving energy efficiency. Upon completion of the significant investment to upgrade and modernize the Elefsina refinery, in 2013, (preceded by that of the Thessaloniki refinery, in 2011) the HELLENIC PETROLEUM Group set the year 2014 as the base-year for environmental performance improvement. Reduction of Carbon Footprint by at least 250,000 tn CO2 investing in renewable energy (at least 100MW self-produced electricity) through the next 10 years. HELLENIC PETROLEUM rigorously implements its environmental policy, a policy that commits our employees and is embedded in every operational activity. 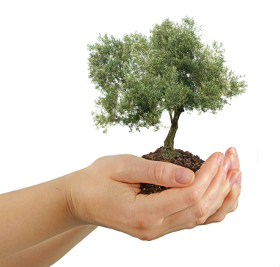 The vision, environmental policy, environmental objectives for each activity, the monitoring of all environmental parameters through European indicators, the benchmarking with the performance of the oil industry sector in Europe, continuously providing environmental education to personnel and stakeholders and the implementation and certification of environmental management systems across the wide spectrum of Group’s activities, are all key to the organization and management of environmental issues. HELLENIC PETROLEUM regularly assesses compliance with the relevant environmental management procedures, at every facility, either through internal audits conducted by qualified and experienced personnel or through inspections made by independent external accredited certification bodies. The Group also monitors the development of environmental key performance indicators (KPIs) which are included in the Group’s regular reports and the staff performance evaluation criteria. Furthermore the Group, with the objective of continuous updating on the best environmental practices and the development of corporate culture, on environmental protection and management, constantly implements a number of activities concerning ongoing environmental education and awareness for its employees, customers, suppliers, subcontractors, public and local authorities, etc. Indicatively, in 2014, 86% of our employees at the Group’s refineries were trained on environmental issues amounting to 5,163 man-hours. Since 2005, HELLENIC PETROLEUM, with the active participation of its employees, has been recycling paper, plastic, small and large batteries, fluorescent lamps, electronic equipment and aluminum, at all of its facilities and offices. The policies on energy and climate change constitute significant challenges for the Group, particularly for oil refining, as one of the main productive activity sectors. With the continued increase in energy demand, the refining sector has a vital role in ensuring energy supply. At the same time, greenhouse gas emissions need to be reduced accordingly, in all sectors of the economy, so as to effectively tackle climate change. Moreover, Greece as a country with a large coastal front needs to gradually begin strategic planning for adaptation and tackling the impacts from climate change. The Group positively contributes to initiatives combating climate change and reducing greenhouse gas emissions through increasing its energy efficiency in production processes and investing in renewable energy sources. 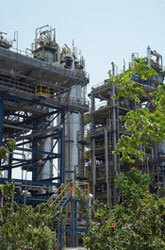 CHP units, for combined heat and power generation, operate at all of the Group’s refineries. These units contribute to the avoidance of significant CO2 emissions, which would be emitted if the self-produced electricity was generated from a provider (such as PPC), using a different fuel mix. When it comes to the monitoring and reporting of emissions, HELLENIC PETROLEUM Group systematically monitors direct CO2 emissions (Scope 1) as well as indirect emissions (Scope 2 and 3) to the maximum extent of its activities. 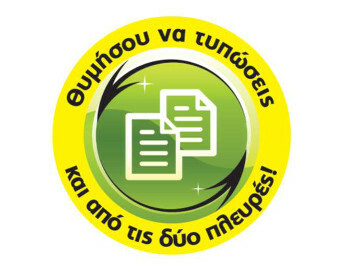 Indicatively, the estimated CO2 emissions from the sea transport of raw materials and products and the estimation of the carbon footprint (carbon footprint project) of all activities in the Group's office buildings (Headquarters and Aspropyrgos, Elefsina and Thessaloniki refineries - MyClimate Certification). 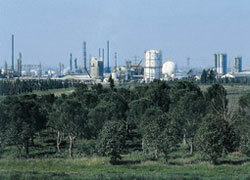 The Group's refineries have participated, since its formation, in the EU’s Emissions Trading System (EU ETS). Meanwhile as of 2013, we will follow all procedures for monitoring, calculation and verification of emissions according to the regulations of the third phase of the EU ETS 2013-2020. It is underlined that, during the EU ETS 3rd Phase, the compliance costs have increased significantly, due to the smaller number of allowances in relation to the actual emissions. It is noted that the future of the EU ETS will directly depend on its planned structural reform, as well as on overall EU policies concerning energy and climate. The Group closely monitors these developments and participates in the pertinent consultation process, so as to protect the competitiveness of European refining. HELLENIC PETROLEUM aims at reducing both air emissions and waste generated, through specific actions, such as maximizing the use of gas fuels, the use of cleaner fuels and the implementation of advanced technologies in the production process. In 2014, at the three Group’s refineries, the most significant air emissions for the oil sector were reduced by up to 16% (relative analytical presentation at http://sustainabilityreport.helpe.gr/en/environment/air-emissions-waste/. Indicatively, SO2 emissions remained much lower (-57%) than the environmental operating conditions’ current limit (in tn/year). Note that the above mentioned limit concerning on sulfur compounds emissions decreased in 2013 by 30% compared to the limit in force until 2012. As part of the broadening of clean fuel options, the Aspropyrgos refinery is already connected (2014) to the Greek gas network; the Elefsina refinery is in the process of being connected to the gas network. With the full operation of the new Elefsina refinery, in 2014, the improvement at the refinery’s emissions was significant and exceeded the estimates of the approved Environmental Impact Study (EIS). Indicatively, emissions of sulfur dioxide (SO2) decreased by >80%, against 70%, while nitrogen oxides (NOx) emissions decreased by >30%, against the 11% estimated in the Environmental Impact Study. In addition, the air quality in the region significantly improved, according to the measurements recorded at the environmental station and the municipal station, where zero concentrations of SO2 were recorded and NOx concentrations of 78% below the relevant limit and 12% lower than the initial NTUA’s study estimated for the project were recorded. With regards to the management of wastewater and solid waste, primary objectives include the prevention and minimization of production, the recycling as possible; and in situ management and treatment in the best possible way for both the environment and human health. HELLENIC PETROLEUM has invested in modern waste treatment facilities, such as the 3-stage wastewater treatment units and the oily sludge treatment unit, using biodegradation technique, in the Thessaloniki industrial complex. The latter, in 2014, increased its efficiency significantly, by introducing the addition of specific bio-enhancing microorganisms in the process (bioaugmentation). A 36% reduction in solid waste was recorded, while wastewater showed a slight increase of around 5%, mainly due to the full operation of the Elefsina refinery. Over 60% of total waste was recycled, exploited through raw materials recovery processes and reused (relative analytical presentation at http://sustainabilityreport.helpe.gr/en/environment/air-emissions-waste/). 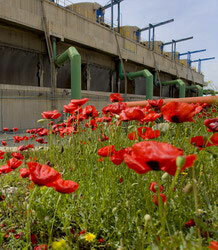 Moreover, improved performance in terms of the quality of treated effluents continued. The average index for hydrocarbons for the three Group refineries is 40% lower than the statutory limit. HELLENIC PETROLEUM aims to reduce the consumption of energy, water and raw materials and invest in the recycling of materials and raw material. The Group’s total energy consumption appears slightly increased, mainly due to the full operation of the Elefsina refinery. Despite the increase in total energy consumption, electricity consumption has decreased since 2013, as well as CO2 emissions derived from electricity consumption. A considerable part of this decrease is attributed to the self-produced electricity which represents 37% of total electricity consumption. Furthermore, a 11% reduction in water consumption has occured and a particularly high increase in water recycling/reuse from 4% to 17% (analytical presentation at http://sustainabilityreport.helpe.gr/en/environment/management-efficiency/). In the context of its Quality, Safety and Environmental Policy, the Group is committed to: supplying products and services, which fully comply and/or are better than the agreed specifications, providing full technical specifications on the quality of products/services to all concerned, and offering customers, partners and staff the opportunity to evaluate and contribute to further improving the quality of products and services provided. The Group has designed and implemented Management Systems which meet the requirements of relevant international standards in order to meet its Health, Safety and Environmental Policies as well as achieve the implied objectives. (The Group Certifications per Facility can be reached at http://sustainabilityreport.helpe.gr/en/environment/installations-certifications/). The Group follows a strategy for the further development of its activities and the continuation of the existing activities with respect to the natural environment. Note that all of the Group’s facilities are in areas legislated for industrial use and are located at a distance from protected areas (e.g. NATURA, RAMSAR). The Group has developed actions to protect and enhance the natural environment and ecosystems which are considered a priority and a key pillar of sustainable development. 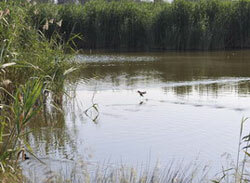 Examples include the promotion and monitoring programs of the Lake Koumoundourou ecosystem and the adoption of the Gikas hill, in Aspropyrgos, reforestation program. HELLENIC PETROLEUM closely follows developments concerning the effective implementation of the national strategy for biodiversity; and, at the same time, has shown its willingness to cooperate with the national authorities to this effect. The monitoring of new European trends and the integration of international recognized tools are expected to contribute significantly to the implementation of innovative conservation practices and biodiversity management. The term biofuels (first generation) is used to describe fuels that are produced using raw materials from crops - such as sunflower, rapeseed, wheat or sugar beet - and organic waste such as used oil. Biodiesel, a fuel which possesses similar properties to diesel, which can be used in most conventional diesel vehicles mixed with conventional diesel. Biodiesel is made from vegetable oils such as rapeseed, sunflower or even used oils. Bioethanol, which can be mixed directly, or as a component, with gasoline and used in conventional gasoline vehicles. It is produced through the fermentation of sugars from raw plant materials such as beet or cereals (wheat, maize). HELLENIC PETROLEUM explores bioethanol’s potential use as a gasoline component through a relevant research program conducted in cooperation with the National Technical University of Athens’ Fuels and Lubricants Laboratory. The research program investigates the pilot introduction of bioethanol, as a raw material for bio-ETBE (ethyl-tertio-butyl-ether) production, which will be used as gasoline’s component. Today, biofuels are the only available substitutes of fossil fuels in transportation. Biofuels are environmental friendly and they are broadly used since only minor changes in existing vehicles and infrastructure are required. Biodiesel is a fuel with properties similar to diesel and can be used in conventional diesel vehicles blended with conventional diesel fuel.